I've been on the road for a week or so, and I haven't had the opportunity to take pictures, make video, or any of that stuff, but I have found a couple of neat things. The first is a bottle of Noodler's Texas Bluebonnet ink. My mom knew that I was looking for some of this, so she found the last bottle of it in Dromgoole's. it's a Houston, TX store, and if you're in that area then you need to stop in. It's a great store. 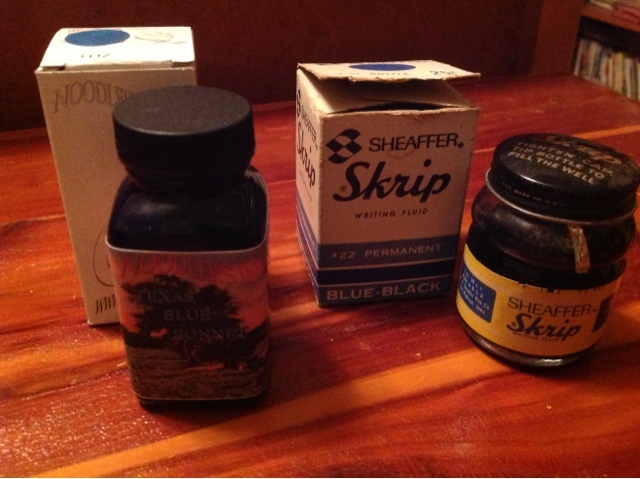 The second thing is an old bottle of Sheaffer Skrip #22. I've gotten to stop by my Grandma's house in AL, and this was sitting in the desk in the spare bedroom that I use when I'm there. It looks like its still good, but I haven't had a chance to dip anything in it to make sure. I'm looking forward to the DC Pen Show. Anyone else planning to go? What's on your list to see, buy, or drool-on? 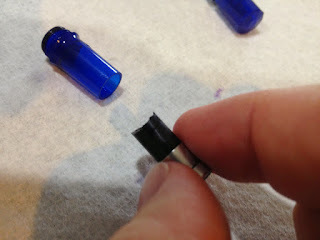 Here's the second of the 5 Franklin-Christoph writing fluids. I would say that this one is a little bit better than the Dark Denim. Some people find Dark Denim to be a bit under-lubricated, though I didn't. Olde Emerald, on the other hand, doesn't seem to have that problem at all. I've used it in several different sorts of nibs (including a whole raft of Franklin-Christoph nibs that I picked up for my Collegia), and it has worked well in all of them. I enjoy a good green, and Olde Emerald is likely to get into my regular rotation, if there is such a thing. This green shades really well, as you can see in the swatch to the left. The Franklin-Christoph site lists the ink with a ph of 8.5, so it's just a little bit basic. I wouldn't worry about it harming a pen, but I would be really careful about mixing this ink with anything. I actually forgot to take a picture if this page without the pen in the way, but I guess it doesn't obscure too much. You can see that the model of the pen is significantly darker than the text below. I had inked this pen up, and then it sat around for a while without being used. It wasn't hard to get started, but it was darker for a while. The 11 second dry-time isn't all that bad on Rhodia, but it's not super-fast either. Clockwise from the top, I have an EF, M, Broad Stub, and Broad nib. I don't have a fine nib, but I think I have a pretty nice set of nibs to test with, now. Olde Emerald doesn't change a whole lot from nib-to-nib, but you can see a little bit of difference. I like the broad stub the best, but Mike Masuyama is an excellent nib-grinder, and he grinds all of the custom nibs for Franklin-Christoph. Here's the review video. I got to talking about this ink a bit, and it's a little longer than average. Long story short, Olde Emerald has some water resistance on regular (or sub-regular) papers, but not much on the coated Rhodia paper that I mostly review on. Took this while the smear was still wet. Awesome, right? I'm always both excited and dubious about a grey ink. They're often too light for me to use very much or too dark for them to look much different from a black. I just checked through my reviews, and I don't really have any grey inks posted. I know I've used some, but I guess I didn't review them. That's weird. Anyway, Graphite is true to its name. It looks like you're writing with a pencil. It's a relatively dark grey that looks not-quite-black when you have a wet nib. The rest of the time, it looks like a dark-ish pencil lead. The Rhodia Dot Pad that I wrote the review on doesn't show any bleed-through, but you'll see some light ghosting through cheaper like the Staples pad that I tried it out on (but didn't photograph). I suppose I could start taking pictures of the ink on cheaper paper. Would anyone care to see that comparison? I show my TWSBI 540 with the cap posted, here. Don't do that unless you're very careful. I think I only posted it so that it wouldn't roll off the page. I don't usually write with it in that condition. This looks a little bit on the green side on this monitor, but it's really more of a grey in real life. Here are a few comparisons with other inks that I have sitting on my desk. Dark Denim is already reviewed, and I'll have Olde Emerald almost ready to go. I have a couple of new Franklin-Christoph nibs coming in the mail, and I want to test the ink in those nibs before I post them. I've got a Walt Whitman review coming, too, but it's been too cloudy to take good pictures. Darn rain. I'd like one clear day so that I can take a raft of pictures! I'll have a water-test up soon, but I keep forgetting to do it. I don't expect that it's very water-resistant, though. Here you go. It does have a little water resistance, but I'd keep it away from your coffee. Yep, it's about that time. By now, everyone should have gotten their Ink Drop. The theme is America, and the inks look to be a good set. De Atramentis' U.S. Constitiution is a nice, pale blue. It looks a bit like Luxury Blue to me because it's a bit dusky. Air Corp Blue Black is an ink that I've had (and loved) for a while now. Noodler's Army Green in its original formulation is a bit more vibrant than the other version, which I've blogged about here. I've never even seen this one. It looks like a nice red, though. Not super bright. Perhaps a little bit dusky, too. Private Reserve's American Blue is probably my favorite of this group. I've never tried it before, but it looks pretty great. It's a really rich blue that jumps off of the page. Sometimes I go through a stretch where I just want to use red inks. I have lots of reds, but very few of them are plain old reds. I usually see them and think "I should get this red, but it's just a red. Nah." So I end up with dark reds, blood reds, and red-blacks, and ketchup reds, and all sorts of things. Well, Online's Rubin red is a bright red. It stands up off of the page with a vibrancy that you can't miss. It does have a bit of dotting on cheaper papers, but I used it to grade some student papers this last semester, and it was totally usable. If you can find any of this ink, snap it up. I haven't found an online source for it since the Goulet's stopped carrying it. I only got samples, and I regret it. The three inks that I've tried from them have been really excellent inks. This is my favorite so far. I had several reds inked up at the time. I'm actually still using Grenade and Matador right now. I need to write up the reviews for those inks, but I haven't gotten to it quite yet. Soon, though. Soon. Here's the water test for this ink. I also show off the pen that I used for the review in this video. It's a Laban PF-900 that my wife surprised me with a few months ago. I had a little problem with the section of that pen, but that's a story for another day.